Grooming isn’t to beautify you but it is a reflection of how you think of yourself! Self grooming is about presenting yourself in the best manner. It’s only an unsaid story about who you think you are and how important you are to yourself. Through our Grooming course you will learn to present yourself in the best way. Proper grooming is essential in today’s time. This creates a positive or negative impression about your professionalism, intelligence, level of sophistication and credibility. 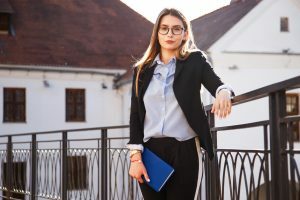 Whether these perceptions are real or imagined, they underscore how, your appearance instantly influences the opinions of strangers, peers, and superiors. Lack of poor grooming often leads to a bad impression, which in turn decreases the chances of a positive feedback. Good grooming and keeping oneself neat and clean shows that the person respects herself and the people she comes in contact with. The aspects of grooming and personal hygiene include appearance, confidence, body language, clothes, hair, nails, breath, body odor and clothing. One’s outward appearance is the first impression she gives when meeting someone new. Formal lunches and dinners are a necessity and one needs to be well aware of the protocol required. Our course will be providing you with the much needed know-how on such seemingly simple, but mostly uncharted territory.